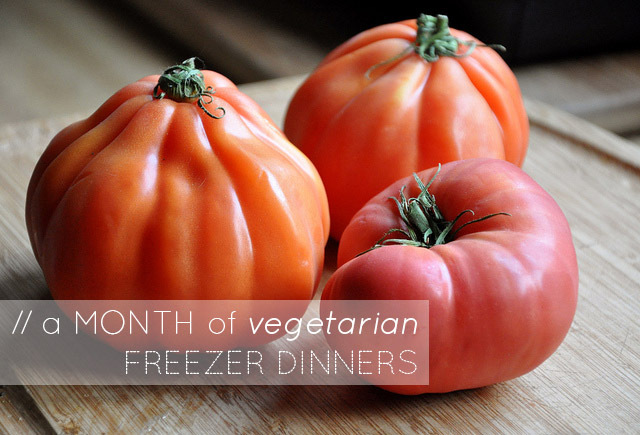 So here we are nearing the halfway point for the month of vegetarian freezer meals. Having most of our dinners decided and already made is crazy amazing. Though the cooking process was intense, I'm already thinking about what we'd like to put on next month's monster menu. I must say, though, being a rookie at all of this freezer stuff, I underestimated the sort of knowledge I would need with regard to reheating our meals and making them the tastiest they could be (especially related to texture). 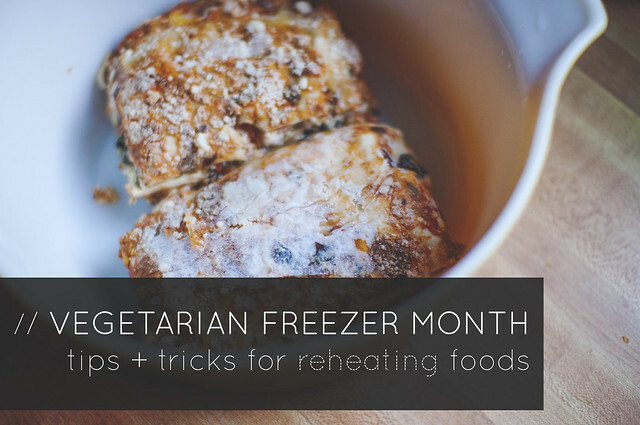 It's been trial by fire, so I'm picked up some tips pretty quickly and continue to find new ways to make the best of these make-ahead meals. What I should have mentioned in my cooking tips + tricks is that before you freeze, don't cook your meal to mush. I did a pretty good job with this at least with the lasagna and chili (the burgers weren't pre-cooked), but our stuffed peppers are pretty mushy when they're re-heated. If I could do it over again, I'd cook everything only 3/4 of the way through. Think more al dente (tender/crisp) than done. #2: Leave Time for Thawing. I was so excited our first night of eating the freezer meals. I went down to the freezer and put the lasagna in the oven to bake for a while at 350 degrees F, only to discover that I really, REALLY should have thawed the lasagna for a while first. We ate dinner at around 9 PM the first night because the inside of those suckers was ice cold. Literally ice in there after 30 or more minutes of cooking. Now I take my meals out either the night before (and place in the refrigerator -- when using the pre-made pizza crust) or by noon the day we're eating it (and place on the kitchen counter). That way, it's still cool, but not rock hard in the center. With my soups and chili, I leave it in the airtight container and place it in a bath of hot water to aid with thawing. And as a general rule, I try to use whatever I've thawed within 2 days. I don't know if this is necessary, but I'm weird about food going bad. #3: Use Your Oven or Stove. We banished our microwave to the basement long ago, which is another story entirely and definitely an issue of personal preference, but to keep the best texture and flavor, etc. -- I think it's best to take the time to re-heat meals in the oven or on the stove. Yeah, this means time for pre-heating and extra cook time, but it's worth it. You can use your microwave successfully, just note that the machine tends to cook meals unevenly, leaving hot and cold spots in random places throughout your dish. I have had mouth-burns and just weird reactions in the past. With the microwave it's also hard to guague when something is over-cooked before it's too late. Basically, there's no standard rule for all frozen dishes, so you need to go on a case by case basis. We learned a lot in the first week what works best for the meals we specifically made. We also learned that tofu is great in lasagna, but watery in stuffed peppers. I learned that I really should wait past the second rise before freezing pizza dough (a frozen EXPLOSION!). Be patient with yourself and with the process. 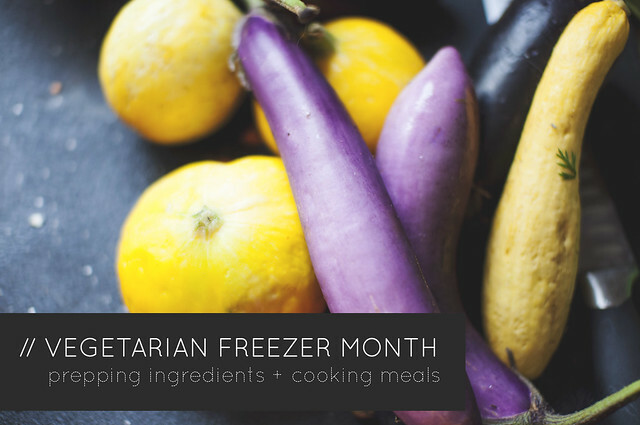 It takes time to learn any new technique, and freezing and entire month's worth of dinners is no different from mastering the perfect crepe or something equally difficult. I'm sure I'll discover new tricks along the way -- but it takes time. To keep from getting the blahs with the same meals week after week, I like to make at least some aspect of the meal fresh that night. 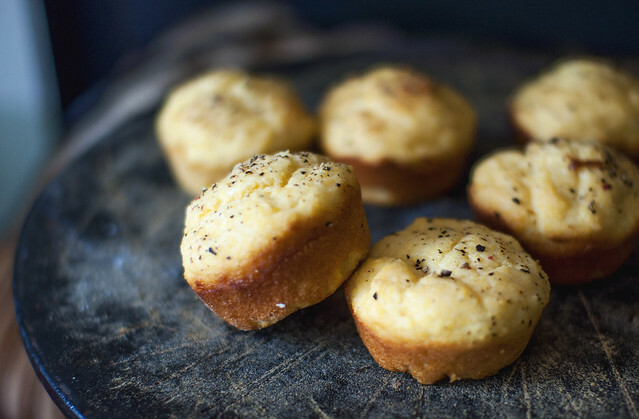 I know this sounds counter to one of the main reasons I decided to freezer cook this month (saving time + dishes), but even a quick one-bowl corn muffin can really liven up a meal. We also budgeted to get some sweet potato fries to have on hand on burger nights. The pizzas themselves aren't premade, just the dough, so that meals also seems semi-fresh and we customize with whatever CSA veggies are in the basket that week. 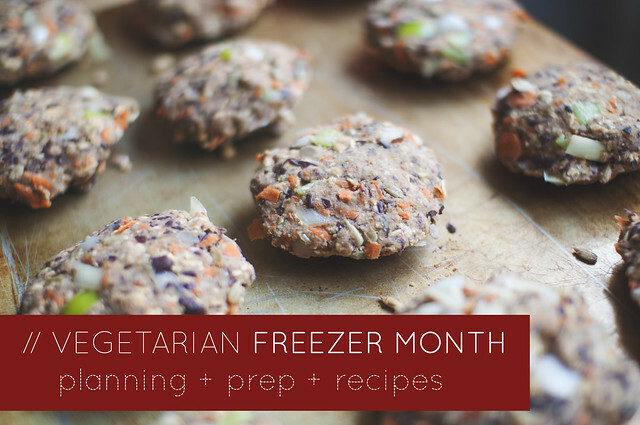 Here's a quick recipe that goes wonderfully with stuffed peppers, chili, and other soups! Preheat oven to 400 degrees F. Generously oil the tins of a standard size muffin pan and set aside. Mix together the Greek yogurt, applesauce, oil, almond milk, and maple syrup. Then toss in the rest of the ingredients and mix until just combined. 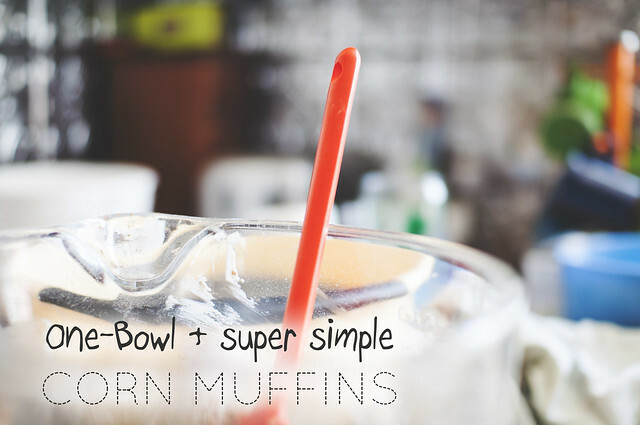 Scoop out evenly in your muffin tin. Bake for 20 to 25 minutes, until edges brown and a toothpick inserted into the center comes out clean. Let cool before turning over pan and serving. If you're just catching up, be sure to check out these posts!